We were so glad we moved to Chichime in the East Lemmon Cays as the predicted extremely high winds and seas DID materialize. We were safely tucked between two small islands with a magnificent view of the protective reef extending for miles in front of us. There was a vast shallow area in front of the boats. Several people dinghied over and walked about on these flats at low tide. Thinking they were searching for shells, I battled the currents and clambered aboard, but there was nothing really but sand and more sand. Swimming was very challenging in the strong weather and there seemed to be currents everywhere. It was rather like having a current pool, where one swims like mad against the flow, but gets nowhere! On one of the islands was a kuna family who paddled over and showed me the mother, Anna's molas. They were the new applique style but quite well done, so I purchased one to give the family some income. They also asked for a bottle of water and Anna requested some nail polish as well. Buying molas can be a more expensive transaction than anticipated! It was a good opportunity to hunker down and get caught up with these journal entries! We listened in on the Blue Water Rallies check in net now that the boats were closer and their transmissions clearer. They sailed through the more than gale force winds with confused seas towering over their boats. Most experienced knock-downs, where the deck went underwater. Several caught fish in their drains (flying fish, I presume). Most also managed to get seawater inside the boat. A handful managed to warp the 4" stainless steel shafts on their wind vane steering systems. I guess we will not be able to complain about ANYTHING after their experiences! Anna's family home on at Chichime. After the weather moderated, we travelled back to Porvenir to get our zarpe, a travel permit allowing us to leave Kuna Yala and travel to Portobello, Colon, the Panama Canal and into Panama City. Since it was a Saturday, wehad to pay an overtime fee. The process was more expensive than we thought- $143.00! But at least we are now legal. We were glad we did go because we met some more of those brave boats who had battled their way into the San Blas. These included ENCHANTRESS, CAMOMILE, NAUTIBOU, BIONIC and LADY ALICE. We had a nice chat with several of them and listened to their battle stories. We imparted some local knowledge about the area and shared some files from the computer. We also went ashore at the neighbouring island, Wichubwala and purchased a few items at the little store. 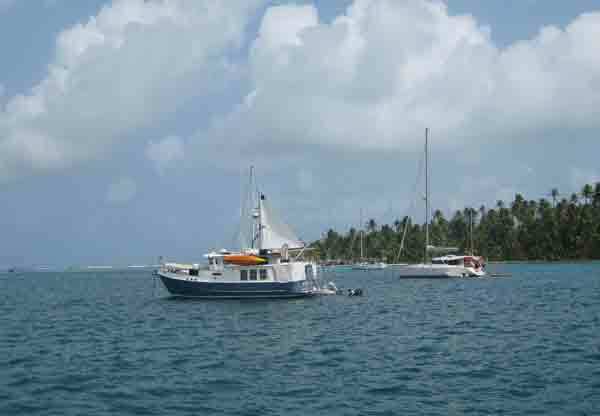 It was still very rolly in the Porvenir anchorage and more boats were arriving. We decided to move back to Chichime in order to leave the next day for Portobello. There will be too many boats to have the admeasurers complete their work in two days, so several of us who have been here a while have volunteered to go to Colon early to get measured for our transit. We heard EMILY GRACE on the radio satating that they were on their way to Chichime as well with a view to leaving the next day for the same destination, so we met up with them again! 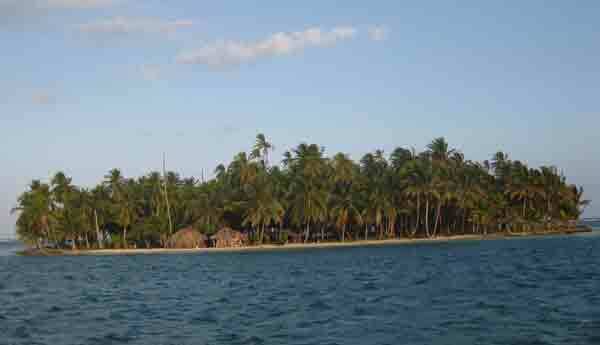 While we were having a very quiet respite in Chichime they went to Carti and Gerti Islands and had a wonderful adventure. They took a LONG hike along a river. Afterwards they gave the guide some children's clothes. He in turn invited Emily to sail in his ulu! We have had a great influence on EMILY GRACE. Here she is trying to be a sailboat too!